The Bavarian town of Mindelheim has devised a new literary prize (E5,000) for books that encourage young adults to think and question. The prize is awarded by a jury made up of seven 17-18 year olds from the local school, plus a teacher and advisor. They selected from a list of about 100 books. And, amazingly, I won – for the German version of The Philosophy Gym. 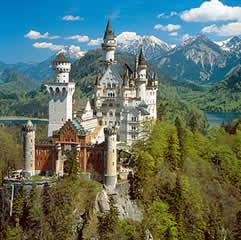 So I am off to Bavaria in May for 3 days, with my wife, as the guests of Mindelheim and to collect my prize. It’s going to be a very surreal experience, as I am told there will be an evening in my honour with a laudatory speech by a former Bavarian arts and education Minister, plus champagne, a band, and “fire show” in the town square. I also asked if I could arrange to see the amazing Neuschwanstein castle, which I’ve always wanted to see since watching Chitty Chitty Bang Bang as a kid – and they’re pleased to take us. Obviously I’m pretty thrilled to receive any sort of prize, but I should add it’s actually a really good idea of Mindelheim’s to come up with this award –I wish it great future success. There’s nothing remotely like it. I just happened to be on my blog when I saw this. So let me be the first to congratulate you on your own blog. I think it's a great idea for a prize, and, having read The Philosophy Gym (5 years ago now, while I was recovering from a major operation) I think it's a worthy winner. You're a credit to your profession in more ways than one. Will you have to give your acceptance speech in German? Warm congratulations, Stephen. It's a well-deserved tribute to a lively thinker. Enjoy your visit, and I hope you forge some lastingly useful new links there. Congratulations Stephen. It's a great book , I still use it with my groups. Congrats, Stephen! I'm sure you'll enjoy the Neuschwanstein castle. That's sort of a prize in itself. Congratulations Stephen. I've not read Philosophy Gym but have read a couple more of your books (Xmas Files & The War for Children's Minds). If these are indicative then I'd say very much deserved. The Philosophy Gym got me interested in taking up philosophy as a part time student with the OU and Oxford online about 5 years ago. I'm now working towards an MA in Philosophy. All for a little conspicuous pink book that jumped out at me in a book shop. Thanks! A well deserved prize. Congrats! Well done; well deserved. The Philosophy Gym has been a good pressy for young relatives; and The War For Childrens' Minds gets dished out to teachers and young parents I know. Congrats Stephen, that is excellent news. On a minor sceptical note: 17-18 students read 100 books? Congratulations, Stephen - very well-deserved. I can't help but echo Kosh3's scepticism, all the more so because it looks as though all the 100 books are on philosophy, inculding the intriguingly titled "Pippi und Sokrates". Congratulations! What a brilliant prize to win.